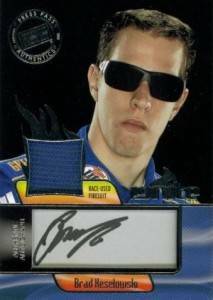 Press Pass offered a swift response upon discovering that Brad Keselowski autographs inserted in 2012 Press Pass Ignite Racing were signed with an autopen. In a company statement, the card maker not only acknowledged the mistake but took measures to make good with collectors. Those who pull a Keselowski Ignite Ink autograph from the product can send the card in for a replacement. Press Pass is going out and getting new autographs from the racer. They will be creating new cards that will pair the signature with a prime race-used firesuit swatch. They will also receive a 2012 Press Pass Ignite retail box for their troubles as well as be entered into a draw to win a trip for two to a race. To arrange a replacement, collectors are asked to email Press Pass at info@presspassinc.com. Press Pass also said that they contacted drivers and their representatives to review autograph protocol to ensure a product's integrity is maintained. Autopens are bad enough when they're used for through-the-mail autographs. But to have them show up in a pack of cards is as close to a worst case scenario for collectors. That said, Press Pass should be commended for coming forward quickly in the matter without dancing around it and taking steps to make things right with those impacted. 2012 Press Pass Ignite Martin Truex Jr Autograph Relic Card! Nascar!